I have been thinking a lot about the need for new business models. By “new” I mean truly innovative and deeply ethical—in other words, revolutionary, or even better, evolutionary. I’m of the opinion that we have plenty of evidence and experience to harvest the lessons of what works and what doesn’t work in our current economic system and the way we engage in business. We left out too many stakeholders, too many voices, too many systems, as if they were externalities. In my quest to find out who else is thinking along these lines, I’m having conversations with a lot of people: consultants, business leaders, educators, activists, and researchers. 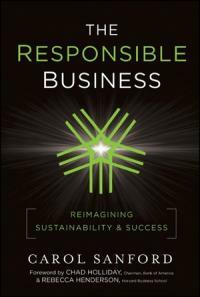 In one conversation a few months ago, a colleague recommended the 2011 book The Responsible Business: Reimagining Sustainability and Success by Carol Sanford. I consider it one of the most exciting and systemic perspectives on the co-evolution of business and society. Corporate Social Responsibility (or CSR) could be considered a first step in the right direction, but usually CSR initiatives are, in Sanford’s language, “responsibility projects” that seek to be responsive to external expectations, standards or goals. The good news is that companies have discovered that becoming more proactive and developing strategies that weave responsibility across the organization produces better business results. But there is an additional level of responsibility where companies “can actually improve and evolve healthy systems,” according to Sanford. The responsible business understands that, as humanity, we find ourselves in a period of rapid evolutionary change and “consciously accepts the role of partner in the co-evolution of communities and living systems,” Sanford wrote. Sanford’s view of stakeholders is grounded in empathy. The responsible business is not self-centered but it’s committed to connect emotionally with these stakeholders in order to create a reciprocal relationship: a relationship that creates value for all involved. The “stake,” or care, for each stakeholder group is a source of valuable information to guide the actions of the responsible business. For example, the customers are looking for products and services that give them quality of life and the fulfillment of their purpose in life. Co-creators want opportunities to learn and contribute creatively through their work to something meaningful that’s aligned with their values. Earth’s stake is the ability to create the conditions for the ongoing flourishing of life. Communities seek healthy and vibrant participation of their members in the creation of their future, their cultural identity and connection to their place. Investors care about the lasting value that the company can generate by brand equity and customer loyalty. So all the stakeholder groups have a stake that is interdependent with the others. What I particularly like about this framework is that when we consider the stakes of each group it becomes clear that they are not separated. In society at large, the investors of a company are also customers of many other businesses, members of communities, co-creators of multiple organizations throughout their lives. And, of course, we all depend on the life supporting services of our planet. “The stakeholders comprise a living system because each is dependent on the others,” Sanford wrote. The book is a radical proposal to “reimagining sustainability and success” as its subtitle eloquently expresses. However, Sanford’s real world corporate experiences and language makes it accessible. Her vision and practice as a consultant represent an evolutionary leap in the thinking of the role of businesses in society and, yet, it makes perfect business sense. “The need for sustainability and corporate citizenship officers,” she wrote, “will simply disappear into the work of all leaders. The organizations of the future—the ones that will be able to adapt, survive, and thrive—will be systemically integrated into the fabric of society. Saying “sustainable businesses” will be redundant because, for a business to be successful, it would have to be a responsible business. Last week I had the pleasure of meeting Sanford in person and we had a wonderful, deep conversation that spanned from personal experiences to professional aspirations. I consider her a great teacher and a mentor; a woman with an incredibly sharp intellect and a generous heart. I’m inspired by her work and immensely grateful for the opportunity to share this learning path with her.